For other uses, see Ophiuchus (disambiguation). Visible at latitudes between +80° and −80°. 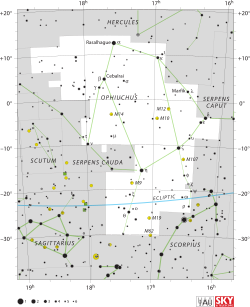 Ophiuchus (Οφιούχος: say it 'Ofi-youkus'), is one of the 88 listed constellations. In Latin, it means "serpent-holder". It is near the celestial equator, and northwest of the center of the Milky Way. Ophiuchus is on the ecliptic, but is generally not considered to be in the zodiac. It's brightest star is Rasalhague. The Voyager 1 probe is within the borders of Ophiuchus. This page was last changed on 13 January 2019, at 23:19.